If you ever get worried about being lost in the woods, or you want to survive the zombie apocalypse, then you really need to get your hands on a new kind of grenade. The M-550 Paracord Survival Grenade is not an explosive device by any means; rather it is one loaded with survival tools that just might help you get through worst case-scenarios of sorts. 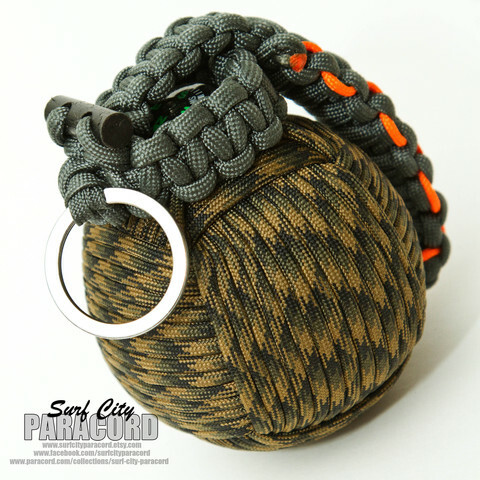 Surf City Paracord, innovators of outdoor gear and sporting goods and who are based in Huntington, CA, have designed this new survival grenade that is woven from over 50 feet of paracord. 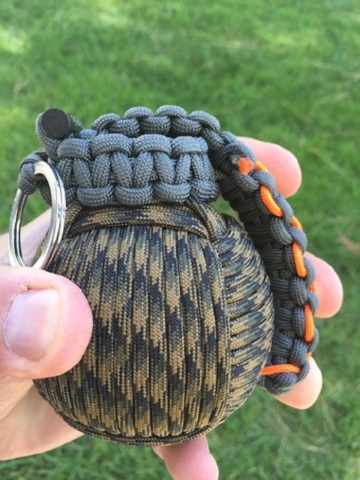 The M-550 Paracord Survival Grenade looks like an actual grenade in its style and design, but once you pull its pin it explodes with all sorts of goodies. This cutting-edge survival grenade also comes with an LED flashlight, which makes working in the night easier, and it can also be used as a signaling tool. This gadget also comes equipped with a mini folding pocket knife, a dog tag signal mirror, a fire starting rod and striker. You use the striker or knife along with the jute twine cotton balls to start a fire. And the list of survival tools only gets better. This friendly-survival-grenade comes with a fishing line (30 feet long), four fish hooks, four split shot weights, two Bobby pins, wire saw, storm proof matches, water proof matches, a whistle buckle, two split rings, and butterfly structures. The grenade is also armed with an orange tactical cord, a compass, aluminum foil sheet, water purification tablets, military grade trip wire, pure napkin tablet, razor blade, a can opener, safety pins, electrical tape, and a universal handcuff key. The M-550 Paracord Survival Grenade comes in mix of colors – pink, orange and purple, to name a few - that blend in nicely with its camouflage design. It is amazing what you can create with paracords, and this gadget will help amateur and expert survivalists alike survive in the great outdoors while living off the land. This grenade will also greatly help people being rescued too. So, when you venture off into the unknown, make sure you take along your M-550 Paracord Survival Grenade. It retails for $69.99 (USD). Editor's Note: There are also similar paracord shaped survival grenades available from Amazon for substantially less. You can look at this grenade and this one for similar features at a fraction of the price.